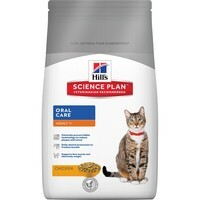 Hills Science Plan Oral Care Dry Food for Adult Cats is a balanced diet that has been specially formulated for cats with bad breath and tartar build up. Developed to provide daily dental protection, the kibble is slightly larger than average and contains natural fibres that will help to reduce plaque and tartar as your cat chews them. I have been buying this product for a number of years now, the Vet is surprised how good my cat's teeth are, well done for the excellent serviced.